What is Valentines about.... really? I don’t think it’s chocolates, champagne and roses, trips to Venice or expensive jewellery. Those gifts are more about demonstrating that one cares, with a bit (or a lot) of indulgence, depending on one’s pocket. Isn’t valentines really about opening the heart and giving of oneself? I think so at any rate. Giving of oneself is by no means restricted to those relationships in which we are romantically inclined. Indeed, giving to a romantic relationship can be extremely challenging because for a myriad of reasons we may feel unable to open our heart, or that we have nothing to give, and therefore material gifts may be a compensatory measure providing no more than temporary satisfaction. Opening the heart and giving of oneself is more to do with making oneself vulnerable by giving of who we are. It requires self acceptance. Of all of ourselves. And a willingness to share who we are and what we have to offer, with someone or something. The act of giving is a paradox, because giving nurtures a feeling of plenty, that begins to dissolve any feeling of lack. Giving brings wealth to the spirit and richness to life and so as we give we feel more full and not more empty. We experience more and not less. When we truly dig deep into the pocket of our own humanity; we find that we are so much more than we have imagined. And so this valentines I encourage you to give of yourself; to somebody or something. Your gift might take the form of supporting a worthy cause by giving of your time and energy. 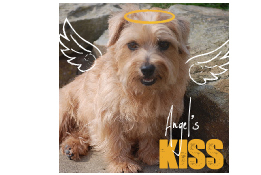 Around this time last year, I made a commitment to canine welfare and established “Angel’s Kiss” as a charitable enterprise within the structure of Mrs Osborne Recommends. This form of regular giving has brought me a lasting satisfaction unmatched by any amount of material gifts.